At Fernwood Middle School in Egg Harbor Township, New Jersey, USA, during a robotology class on Sep. 24th, Costello Connor, the teacher, wrote the sentence ‘Find your name and find your voice and #speak yourself’ on the blackboard. It was a part of RM’s speech at the United Nation General Assembly in New York. Connor said to Hankuk Ilbo on the 4th, “In every class, I write down a message I want to give to my students,” and added, “I saw RM’s UN speech on TV that morning and was so impressed that I wrote it on the blackboard.” “The message from BTS is very important to the younger generation I teach,” he explained why he told his student this part of the speech. The students have taken the teacher’s intention well. 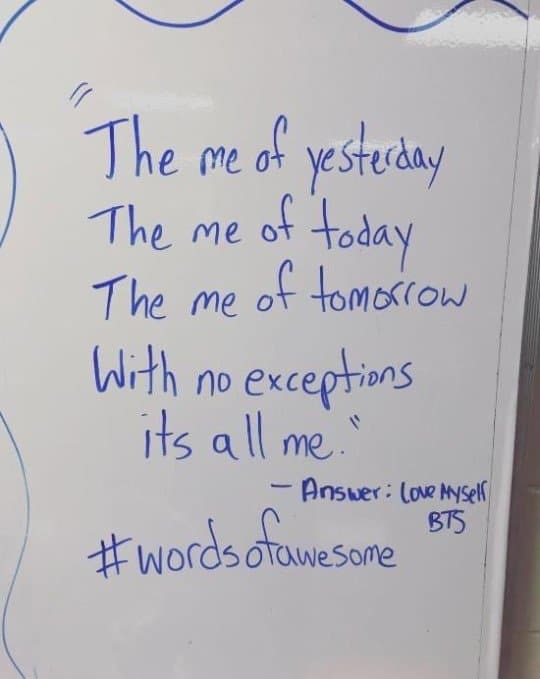 One student wrote, “The me of yesterday The me of today The me of tomorrow with no exceptions it’s all me” on the blackboard in his next class with Connor. RM’s positive message to the world has created a sensation even at the U.S. educational scene. An American teacher sent an email to a student’ parents. 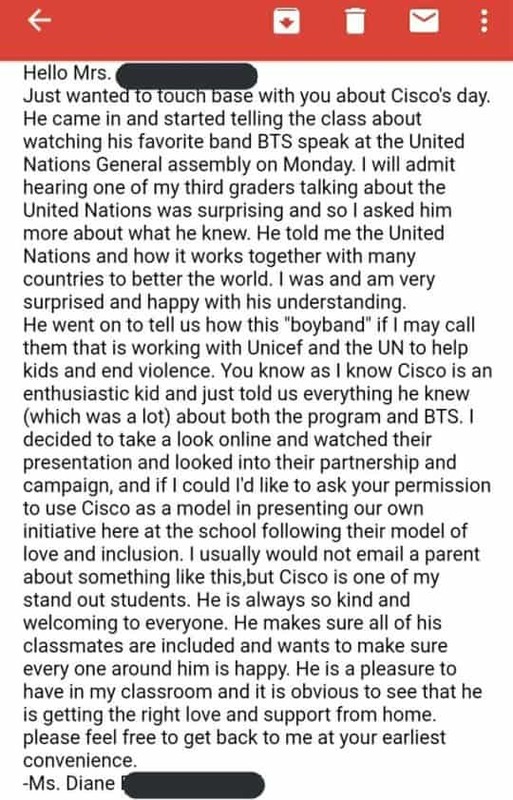 Surprised by the student who made remarks about the U.N. speech of BTS, the teacher wanted to thank his parents for their “right love and support” for their kid. RM’s speech was also a hot topic among local parents. Kim Jaeha, who lives in Chicago and writes columns for major daily newspapers such as the Chicago Tribune and the LA Times, said, “More than seven non-Asian parents at my son’s elementary school asked me if I had seen BTS’ speech at the U.N. General Assembly. Some of them even recorded BTS’ speech to show their children.